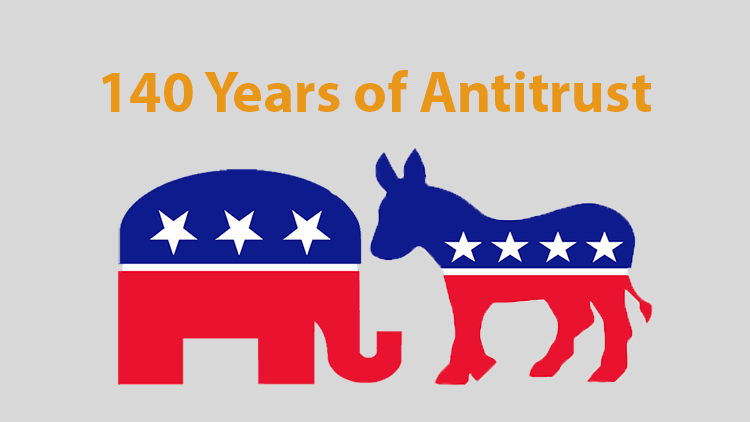 This is the second installment in our series, “140 Years of Antitrust: Are Brandeisian Pro-Competition and Anti-Monopoly Sentiments Coming Back into the Political Discourse?” The first installment can be found here. “A new commitment to promote competition, address excessive concentration and the abuse of economic power, and reinvigorating antitrust laws and enforcement”. This strong language was released last week, without much attention, by the Hillary Clinton campaign in a factsheet that detailed the economic policy proposals Clinton intends to promote if she is elected president.1)“Hillary Clinton’s Vision for an Economy Where our Businesses, our Workers, and Our Consumers Grow and Prosper Together,” October 2016. Last week, the ProMarket blog launched a new short series of posts on the history of antitrust and competition language in political discourse. This series is a response to signs of a revival of these issues ahead of the 2016 election. Clinton’s policy brief may be the strongest signal yet that the potential importance of antitrust and competition issues may increase in the next few years. 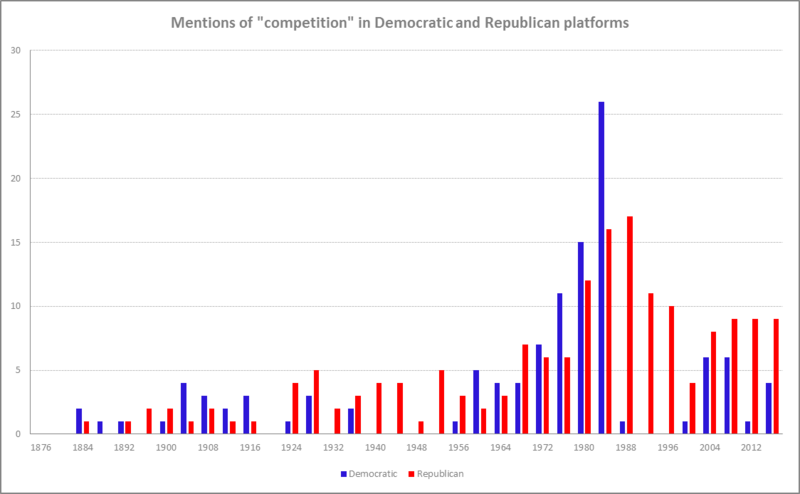 In this post, we aim to review the evolution of economic language related to competition in all Democratic and Republican platforms from 1876 to 2016. We use platform texts archived at The Presidency Project of the University of California, Santa Barbara. We used an online tool for automatic word analysis but context is extremely important (e.g. the word “trust” can mean both a business structure and confidence; or “regulation” can also relate to family planning), so in some cases we also performed human analysis. Because some of the terms can be mentioned in conflicting contexts, the data should be treated as indicative of the discussion of these terms and not as an indication of support or criticism. This is especially the case in later election cycles, as the discussion evolved. In this installment, we will go into detail into the platforms, analyzing mentions of competition. In the next part, the terms analyzed will be antitrust and concentration of power. The last decades of the 19th century in the U.S., following the end of the Civil War, the abolition of slavery, a higher influx of immigrants, and the Industrial Revolution, saw rapid growth, led by a shift from agriculture to manufacturing. Wages in many parts of the U.S. rose significantly, but so did inequality. This era also led to the creation of huge business enterprises–trusts. The businesspeople who controlled these trusts were active in finance, real estate, steel, copper, coal, retail, oil, railroads, and other areas. Trusts became so apparent and evident that in 1890 Congress passed the Sherman Antitrust Act, which was the first federal competition statute. The second major legislation to promote competition was the Clayton Act of 1914 that expanded and added substance to the U.S. antitrust law regime. The third was the 1933 Banking Act (better known as the Glass-Steagall Act), aimed at banking. Nevertheless, the term was not mentioned in any significant way in either the Democratic or Republican platforms until the late 1960s–some 80 years after the Sherman Antitrust Act was passed. Between 1876 and 1964, no platform mentioned competition more than 5 times. In his 1996 book Contrived Competition: Regulation and Deregulation in America, Harvard economist Richard Vietor laid the groundwork for the undercurrents that shaped the regulatory environment from the beginning of the 20th century.2)Richard Vietor, “Contrived Competition: Regulation and Deregulation.” Belknap Press, 1996. The era of regulation, he wrote, is framed by the Great Depression of the 1930s and the Great Stagflation of the 1970s. The near collapse of the American economy in the 1930s was mainly blamed on the failure of competition. The type of competitiveness that prevailed in the decades preceding the Depression resulted in trusts, pyramids, “corporatism,” and big business. And what allowed this to happen was the consensus of state/local regulation and the near absence of the federal government from the regulatory environment. This reckoning led to a new consensus that was prevalent mainly during the Franklin D. Roosevelt era: the government, not markets, would restore the public’s confidence. That consensus led to a wave of regulatory legislation by the federal government, especially during the 1930s. The person FDR trusted with achieving these goals was Thurman Arnold, a lawyer who later became a professor at Yale Law School. 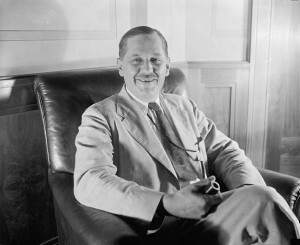 In March 1938, FDR put him in charge of the Antitrust Division in the Department of Justice, a job he kept until 1943. But by the late 1960s, the era of quick growth all but wore out. Two major international developments and one domestic development had a significant influence on both parties’ attitude toward competition and regulation. The first international event was the 1970s oil price shock, which brought the price per barrel from around $20 in 1973 to about $115 in 19805)Crude Oil Prices – 70 Year Historical Chart. (Prices then decreased, but remained high until late 1985). The second international issue was the developing and increasing balance of trade deficits that began in the mid-1970s.6)United States Balance of Trade, 1950-2016. On the Republican side, mentions of competition started picking up in 1972 and peaked in 1984. This specific Republican platform language on competition and antitrust before the 1972 elections can offer some cynical perspective on the possible disconnect between political rhetoric and action. The Watergate affair revealed some interesting dynamics and corrupt deals conducted by the Nixon administration that were directly tied to antirust.8)For further reading on Watergate, see here. The tapes and investigation revealed that the Nixon administration used or threatened to use antitrust action to advance their political interests. In 1969, International Telephone and Telegraph (ITT) acquired three smaller corporations, prompting the US Justice Department to file suits against ITT, charging that the mergers violated antitrust laws. Yet two years later, the Justice Department reached a deal with ITT to drop the government’s antitrust lawsuit. The “consent decree” allowed ITT to keep some of the firms it had attempted to merge with. Some observers noted that ITT was allowed to merge with the firms that were relatively profitable, and dispose of the companies that would lose money for the corporation. Later it was revealed that in order to influence the decision of the administration, ITT agreed to secretly give $400,000 to finance the GOP’s 1972 national convention in San Diego.9)Walter Pincus and George Lardner Jr., “Nixon Hoped Antitrust Threat Would Sway Network Coverage.” Washington Post, 1997. 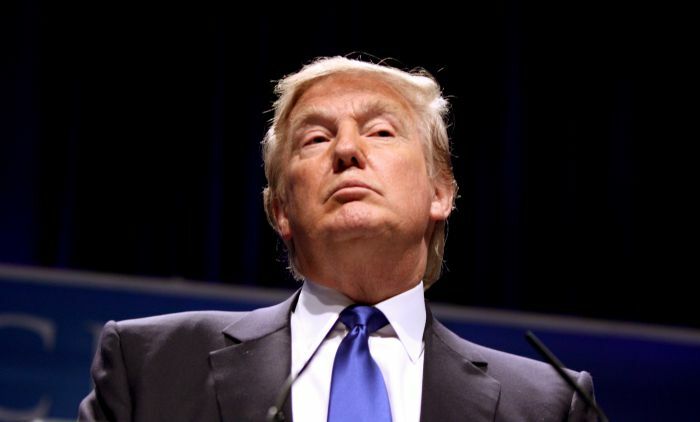 Another use of antitrust as a threat for political ends was revealed in 1997 when conversations held in the Oval Office in 1971 were transcribed for the first time. In the transcriptions, Nixon is quoted as threatening to use antitrust actions against the three major television networks in order to influence their news coverage: “If the threat of screwing them is going to help us more with their programming than doing it, then keep the threat,” Nixon told a White House aide. 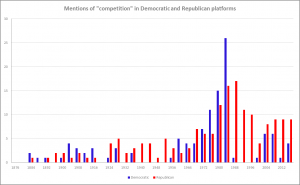 Since that 1984 peak, Democratic platforms seldom mentioned competition. 1. ↑ “Hillary Clinton’s Vision for an Economy Where our Businesses, our Workers, and Our Consumers Grow and Prosper Together,” October 2016. 2. 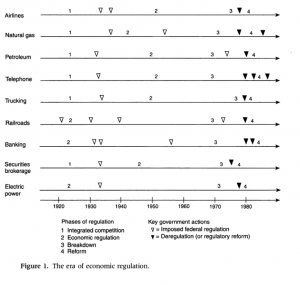 ↑ Richard Vietor, “Contrived Competition: Regulation and Deregulation.” Belknap Press, 1996. 3. ↑ Economic Report of the President, 1973. 4. ↑ Economic Report of the President, 1991. 5. ↑ Crude Oil Prices – 70 Year Historical Chart. 6. ↑ United States Balance of Trade, 1950-2016. 7. 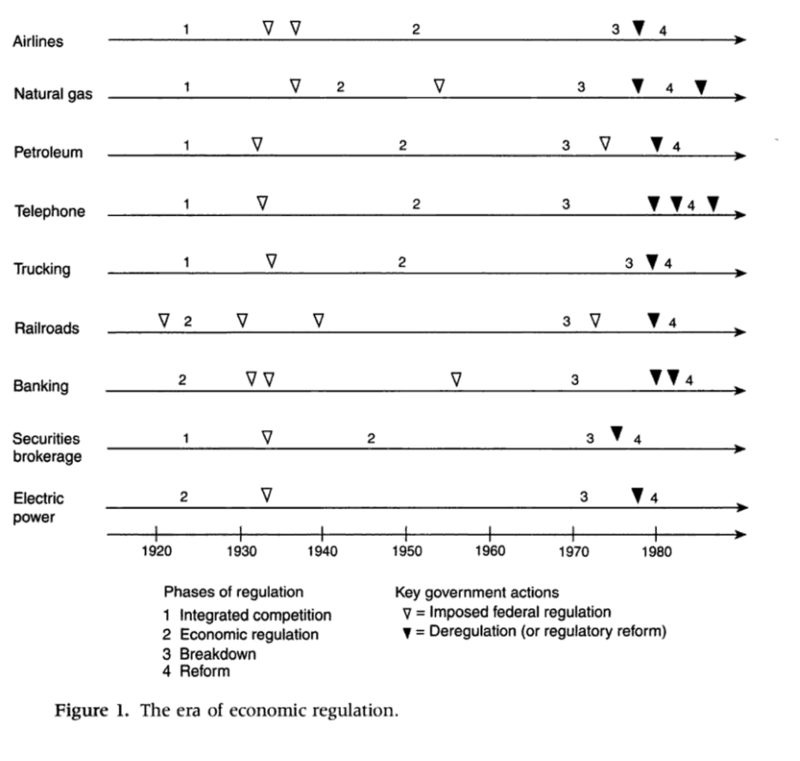 ↑ George Stigler, The Theory of Economic Regulation, 2 Bell Journal of Economics 3 (1971). 8. ↑ For further reading on Watergate, see here. 9. ↑ Walter Pincus and George Lardner Jr., “Nixon Hoped Antitrust Threat Would Sway Network Coverage.” Washington Post, 1997.